Newly renovated, bright and spacious apartment with beautiful sea view, in a walking distance from center, restaurants, beaches, promenade Lungomare, shops and bus stop. It is one of the two apartments in our completely renovated villa built in 1903 and surrounded by beautiful and relaxing Mediterranean garden. Parking is provided in our private garage at the property. The apartment INSIDE: Spacious LIVING ROOM with air-conditioning, flat screen-TV with number of satellite channels, pull-out sofa (140x200cm) that can be easily transformed into a bed for one or two additional persons. A table for four persons is placed in front of the large windows with sea view and lots of air and sun lights. The KITCHEN is brand new and fully equipped with dishwasher, oven, ceramic stove top, fridge with small freezer, water kettle, moka pot, cooking utensils and dishes. BATHROOM is newly renovated and spacious with shower. Washer and hair-dyer is available. Separate BEDROOM is equipped with queen size bed (160x200cm) for two persons and wardrobe. Wi-Fi and heating is available in the entire apartment. Baby cot for babies until 3 years is available. OUTSIDE: Small terrace besides the entrance to the apartment with table, chairs for 4 persons and gazebo. Parking is provided in the private garage at the property (1 parking space reserved). 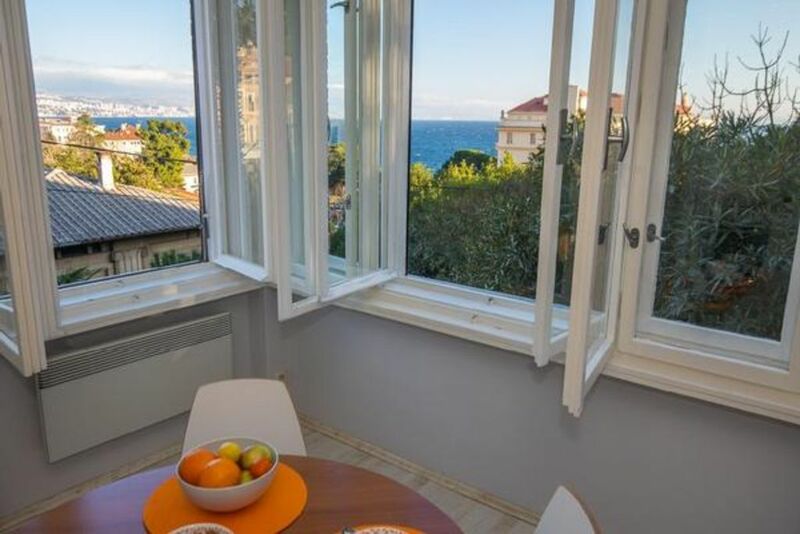 LOCATION: Although the villa is located in the immediate vicinity of the Opatija center, the neighborhood is very quiet and relaxing. Many of our guests leave their car in the garage and don`t use it during their stay since the location is one of the most convenient – everything in Opatija is in a walking distance: 2 minutes to the beach Slatina and to the entrance to the Promenade Lungomare, 10 minutes to the beach Lido, 50 m to the main bus stop (where the bus from the Airport Rijeka also stops), few minutes to the shops, restaurants and parks. The location is also very convenient for one day trips to Kvarner Islands (Krk, Cres, Rab), Istra (Rovinj, Pula), Plitvice lake, Gorski kotar, Venice and Trieste (Italy). 40 km distance from the Airport Rijeka. • Baby cot (only for babies up to 3 years; has to be ordered in advance) 10€/stay. Cot (once per object, Costs amounting to 10 EUR).